The ACE 245-RT Burn Off oven model is a heat cleaning oven, and is a superior alternative to industrial convection ovens. Due to its Radiant Tube (RT) design, the oven is extremely efficient in terms of energy consumption. When compared with convection ovens, it is capable of saving over 20% of energy. 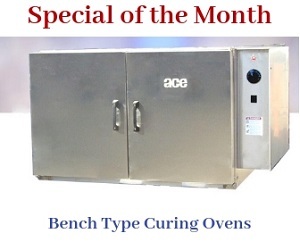 ACE’s burn off ovens are designed with a One Touch Control (OTC) system. The automatic system has a self-adjusting feature, which ensures that the oven’s heat cleaning process is completely controlled from start to finish. The OTC system also ensures that all the heat cleaning cycles are performed safely and efficiently with minimal energy wastage. The technical specifications of this oven model will provide more clarity in terms of its design, construction, power, and heat cleaning capabilities. Volume Over Cart 119 CU. FT.
1 Top Mounted Pressure Relief Hatch 10.03 SQ. FT.